Thus the aim of our proposal is to create a place where these elements can be put together, in a sort of “wine pairing”: cultural events for the local people, a culinary experience for visitors and a great opportunity for young cooks. All these items around wine. To summarize, a catalyst. We are not looking for an icon, nor a luxury hotel. We propose an “engine” that activates the region in different ways. We try to have not only the winery involved, but also the municipality. 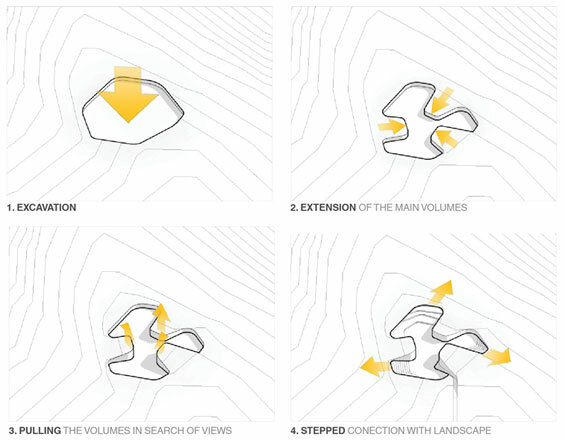 We are not trying to set a building in the landscape, but build with landscape. 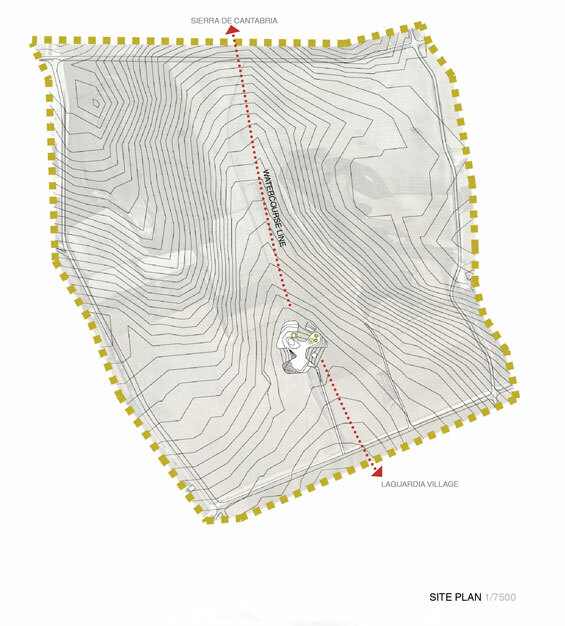 The geometry of the project comes as a result of the interpretation of the landscape pattern and the pro- posed program. All the requirements are met with this solution, respecting the ground topography, thus blending with it. A low carbon footprint and a good endurance are achieved by means of a matrix of local pine wooden slats arranged diagonally. 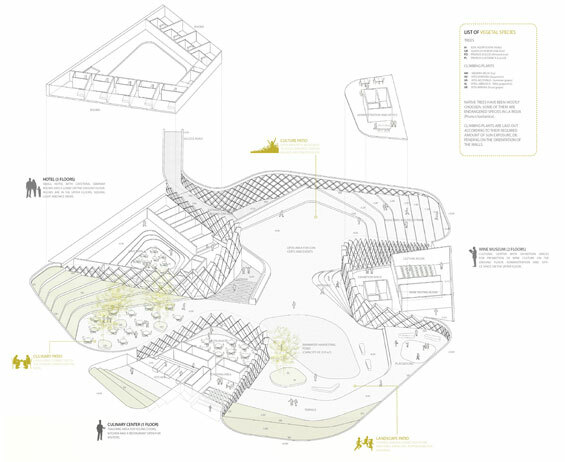 Parameters of views and sun exposure were taken into account in the design process. Sunshade was optimized varying the depth of the facade between 30 cm and 100 cm. The distance between the wooden slats varies according to sun exposure as well as the interest of the views, hence adapting itself to the specific use of every space. Opaque areas are covered with climbing plats (vine- grapes), emphasizing the connection to the landscape. The chosen location, alongside the watercourse line, not only focalizes the most powerful views but also allows rainwater to be easily collected. By means of series of stepped terraces, water is lead to the pond, where it is stored for further use in irrigation of the green areas in the patios and roofs. By placing the inner spaces underground and cove- ring them with green roofs we achieve a better thermal lag. This provides a more stable room temperature. Native trees have been mostly choosen. Some of them are endangered species in la rioja (prunus lusitanica). Climbing plants are laid out according to their required amount of sun exposure, de- pending on the orientation of the walls. Plant boxes are 40cm high, and can be used also as seats. 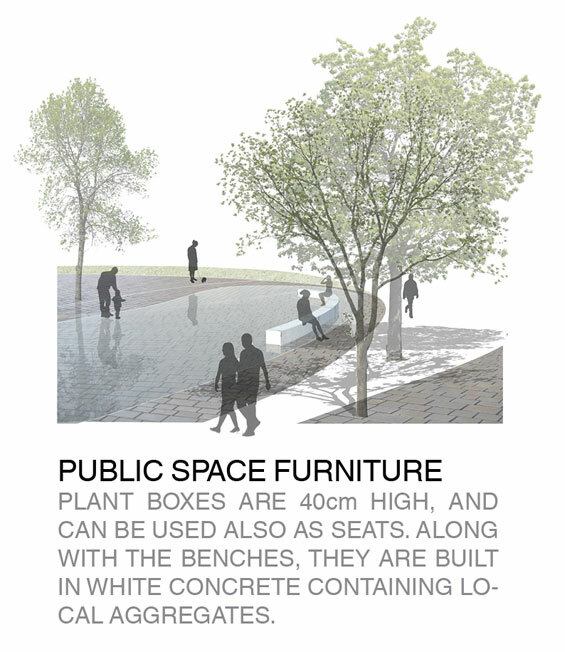 Along with the benches, they are built in white concrete containing local aggregates. 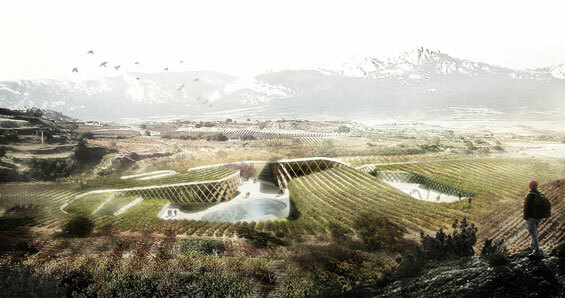 This project by Isabel Rivas & Javier Ureña (RIVAS Y UREÑA ARQUITECTOS) won the 1st Prize in the ARQUIDEAS International Competition Landscape, Architecture and Wine.